Performance artist Shaffer vividly records meaningful encounters with the locals during her yearlong jaunt across Africa—but remains obtuse about the reality of their lives. In the early 1990s, when the disastrous impact of AIDS on sub-Saharan Africa was not as apparent, perhaps the author’s search for happiness and personal validation didn’t seem so self-centered. Debating whether she should marry boyfriend Michael back in California, Shaffer decided to do volunteer work and travel in West and East Africa. After a brief visit with a friend’s family in Morocco, she flew to Abidjan, Ivory Coast, only to be irritated by the squalor and the inhabitants’ assertiveness. So off she went by car with some Italians to Accra in Ghana. She befriended other whites seeking an African experience, and they volunteered to build schools in villages. The work never seemed to get finished before the volunteers moved on, but accomplishing goals was not as important as experiencing the authentic Africa. So Tanya and such friends as Dutch Hannah and British Kate spent time with the locals: Minessi resented her visitor’s insistence that her baby be treated at a hospital, even though Shaffer paid; Christy followed them everywhere, examined their belongings, and taped readings from Shaffer’s private journals; and two ambitious Ashanti students, Bengo and Kojo argued politics with her from a surprisingly conservative position, though she suspected they were gay. 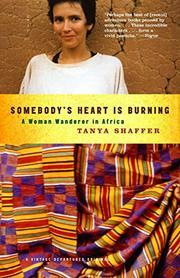 Shaffer moved on to Burkina Faso, where she observed her African hostess mistreating the young servants, and took a motorized canoe in Mali to visit Timbuktu, where she pondered the value of brief but transforming encounters with fellow travelers. Then she was off to East Africa, where she contracted malaria. Almost ready to come home, she called Michael, but he wanted her back immediately, and Shaffer couldn’t promise that—there was still Lamu to visit, where she might discover an important nugget of wisdom. Travel as spiritual therapy for white people: a genre that ought to be passé.